Known for its boom and bust ecological strategy, the Australian Banded Stilt breeds only when large desert salt lakes fill. 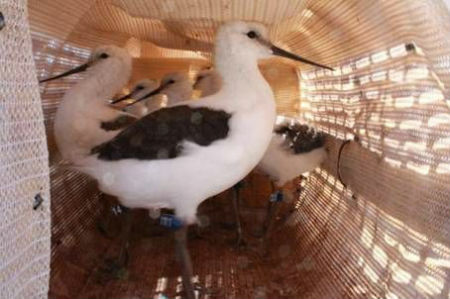 This year's rains brought 20,000 of these shorebirds to Lake Torrens in South Australia. Alastair Wood joined the research team monitoring this rare event. Slogging knee-deep through brine on soft, pebble-strewn mud, we kept a sharp eye on the crèche away over to our left. They’d already seen us, two hulking shapes rising out of the vastness of the lake, and were flat out paddling, straining to reach open water before we could cut them off. The crèche, a small flock of banded stilts, consisted of adults and newly hatched chicks; perhaps a hundred birds in all. We had to work hard to overhaul them, amazed at the speed of the fleeing chicks as they kept up with their parents, paddling furiously into a light breeze. This was Lake Torrens, a saline ephemeral lake in South Australia’s outback. And this was day one of a chick banding expedition, part of a Deakin University and Victorian Wader Studies Group banded stilt research project. 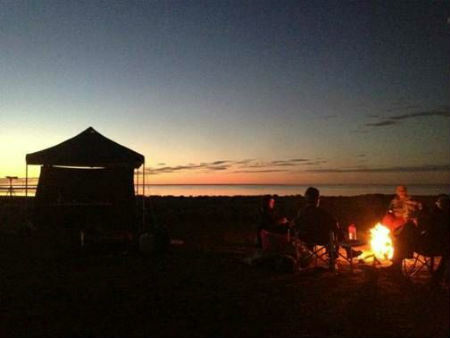 A group of seventeen volunteers from as far away as Melbourne had gathered at Roxby Downs. A thousand tags needed to find legs. 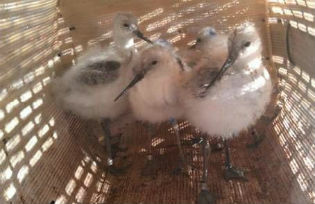 By latest count, about twelve thousand chicks had hatched in this spectacular stilt breeding event. Earlier rains had filled only a tiny part of the lake. But the lake was over a hundred kilometres long. ….. How many chicks were left?…. where were they? The chicks were still balls of fluff; barely two weeks old. The rains were long gone and the shallow lake was drying fast. The banded stilt is an endemic Australian shorebird species of conservation concern. Well known for its boom and bust ecological strategy, they breed only when large desert salt lakes fill. In outback Australia, this is usually a rare event, and lakes remain dry for years, even decades at a time. Like other waterbirds, this species is renowned for its uncanny ability to sense a major rainfall event from hundreds of kilometres away, arriving just hours or days later to breed in massive nesting colonies of thousands or tens of thousands of pairs. Through satellite tracking of individual banded stilts, the banding of chicks and other behavioural studies at breeding events, this project aims to answer conservation-relevant and fascinating questions regarding this unusual species’ life ecology. About twenty thousand stilts arrived shortly after the rains fell. They nested and laid their eggs on an island that was little more than a hump on the lakebed. Reddish shale rock and sparse shrubs and saltbush covered the ground. Water lapped the island’s shores. But by the time the eggs had hatched it was five kilometers away and dropping fast. Chicks need food as soon as they hatch and the only food was in the water. With no time to waste they accompanied their parents on an arduous day-long trek to water and food. Some died on the way, others became easy pickings for marauding silver gulls that had cottoned on to a bonanza and flown up from Spencer Gulf. When the team arrived, the water in Lake Torrens covered no more than 1 or 2% of its total surface; a tiny sliver. Even so, this sliver represented a leg of water several kilometres wide that stretched along the lake’s north western shores for over ten kilometres. The water was shallow, mostly no more than knee deep. 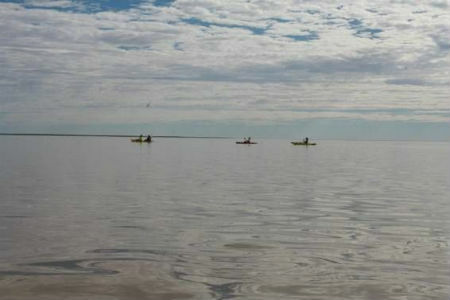 Sixteen volunteers manned single and double kayaks to chase down the crèches and net chicks. Skilled paddlers were much quicker than footsloggers and covered the water in quick time, travelling long distances searching for crèches. Banded stilts can tolerate intense salinity. Brine shrimp are a staple diet and chicks are reared entirely on this compact, nutritious food. Brine shrimp mirror the boom-bust lifestyle of the banded stilt. In a final, dying act as salt lakes evaporate, they lay eggs that are resistant to drying up. Eggs remain in the hard-dried mud of the lakebed indefinitely; for months or decades, until the next rains come to revive them. As soon as chicks hatch the adults lead them to water. Buoyant and robust, they swim quickly. 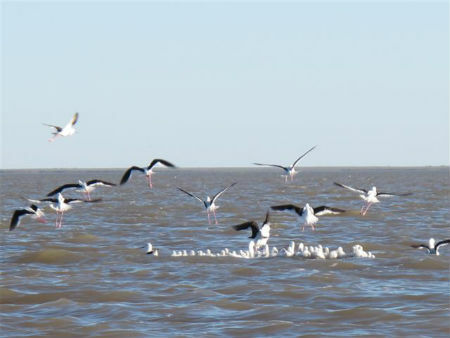 Floating crèches, often consisting of thousands of birds, move kilometres around the lake searching out areas where shrimp are abundant. Guided by the adults, chicks start feeding immediately, unassisted. Creches remain on the water or bunched along the shoreline, day and night. Chicks feed constantly and grow at an astonishing rate, fledging in a matter of weeks. Paddlers are often forced to paddle for hours on end to track down the birds, straining against headwinds and choppy waters. Hypersalinity is everywhere –hands and legs turn white while clothing goes stiff with the salt. The winter sun glares hard off the water and burns into searching eyes. Chicks are scooped aboard in special nets and kept dry in warm, dark containers that encourage them to settle. Once banding is complete, the paddler sets off to reunite chicks and parents. The camp was wall-to-wall open air; no trees or shelter as far as the eye could see. A collection of 4WDs, a gazebo, swags and one-man tents on red stony ground scattered with low, saltbush-like shrubs. Swags were wrapped in canvas to keep out the cold and ward off dew and rain. We were lucky. Nights were long and the all-around silence of the outback hung in the frigid air. The loo consisted of a hessian awning, a shovel and a roll of loo paper. Mornings were low key – before the sun had reached the horizon, sleepy people clutching coffee mugs would be shuffling about. Leaders stood together, shoulders hunched, looked at maps and worked out a strategy for the day. Others scanned the horizon with ‘scopes or glasses, looking for signs of stilts. Nights were relaxed. In bitter cold air the campfire was the highlight. Embers glowed against a clear sky and a myriad of blazing stars. The team slumped in camp chairs and ate hearty meals. Local volunteers from Roxby Downs were lively. They’d make late moves on the campfire, carrying away prize embers in long handled shovels to start their own personal cooking fire, nearby. They’d load it up with an assortment of pots & pans and proceed to knock up gourmet-standard feasts. After dinner everybody relaxed and drank wine. On the final night we discovered the joys of Barossa Valley port from an industrial container and had a BIG NIGHT! Despite difficult conditions, a great all-round team effort had banded and released 428 chicks in five days. Ten days later, when chicks were close to fledging and much harder to catch, this tally had risen to 949, thanks to the supreme efforts of a chosen few. Update – Octoberth. Chicks are now fully fledged and starting to fly all around Australia. Tagged birds have been spotted 500kms from Lake Torrens.